Want 2 SIMs active at the same time? Discover GoodTalk's integrated Dual SIM case.. the future of Dual SIM technology. The brand new GoodTalk Case is a case for your iPhone 6, 6S, 7, or 8 which holds any GSM SIM card, allowing you to add voice calls and sms from that card via Bluetooth®. iPhones only allow you to have 1 sim card active at a time. 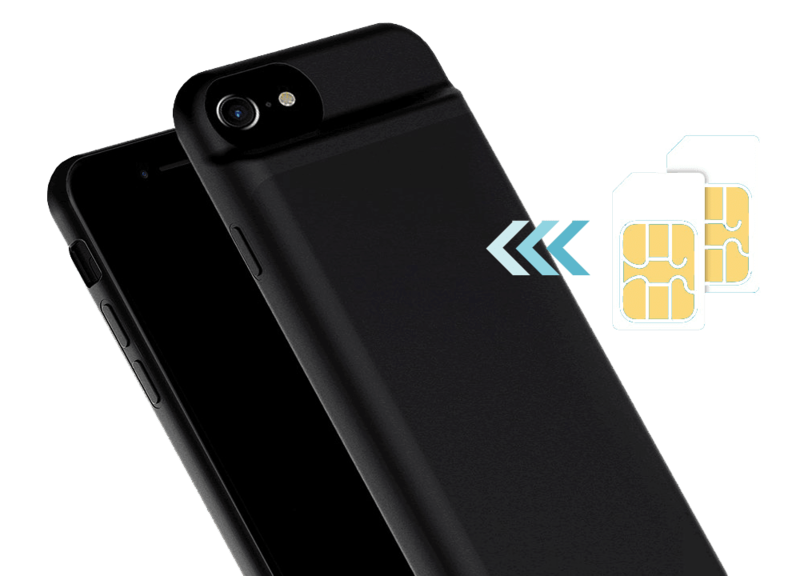 But the GoodTalk Case allows you to have a second SIM card active on your phone, simply by using a case. Do you have more than one SIM? Do you travel frequently and have to swap between local SIMs, or carry an extra phone? Now you don't have to. For the first time you can transform your phone into a Dual SIM phone with 'dual standby': two active SIMs. That means two SIMs active at the same time on your iPhone, with a single Contacts, SMS, call logs, etc. It's as simple as that! GoodTalk Case is a high-quality strong lightweight case with a difference - it has a SIM card slot inside for your second SIM. The case communicates with your iPhone via Bluetooth. Simply insert your second SIM into the GoodTalk Case, then insert your iPhone into the Case. Install GoodTalk's app from the App Store or iTunes. And that's it. Your phone is now a Dual SIM phone, with both SIMs active at the same time. When making calls or texts, simply select which SIM to use: your phone SIM, or your GoodTalk Case SIM. Your phone will indicate which is in use, and will also indicate which SIM incoming calls are made to. GoodTalk Case charges through your usual iPhone charger, and has a very long bttery life - 3 x longer than GoodTalk S.
If you have any questions, why not get in touch?